At about 9:30 p.m. on Thursday (March 10), I went out to the sunroom to check on the dogs, and Pete, our 12-year-old lab/pit mix, was obviously in distress. He was panting and drooling and wouldn’t really move. After a panicked phone call to the local emergency vet, we managed to get him in the car to take him down there. They took him back right away, and within a half hour the bloodwork came back indicating a very serious case of pancreatitis. They undertook “aggressive” fluid therapy to bring his lactate back to normal. At 2 a.m. I called to check on him, and there hadn’t really been much change. The vet called me back at 4 a.m. to report that he was actually feeling worse and that his organs were probably shutting down. By 4:45 Nan and I were back down there saying goodbye, having made the decision not to draw out the inevitable. I have no idea how long he’d been sick. If he felt bad before Thursday night, he did a good job of hiding it; his appetite and energy were fairly normal until then. I hate to think he had been miserable for a while and we missed the signs that could have allowed us to get him to the vet earlier and avoid this outcome for him. 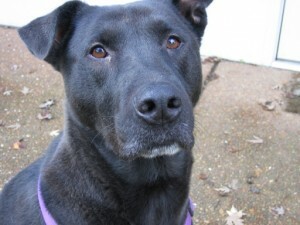 Despite his somewhat intimidating appearance, Pete was really sweet and a true mama’s boy. He was also Rainy’s keeper, letting us know every day when she was done eating and would need to go out (I guess he got as tired of her peeing in the sunroom as we did). As recently as last week, I went in to let them out for their first pee break of the morning, and Pete headed out the door but came back in to poke his head into Rainy’s crate as I tried to coax her out; she was feeling particularly lazy that morning. It’s been a sad few days around here. This entry was posted in Uncategorized on March 13, 2011 by Tracey. Did I mention our tomatoes are really, really small? This entry was posted in Uncategorized on September 27, 2010 by Tracey. After a few years of relying on an old, pieced-together Roland V-Drums kit, I decided to find an affordable used acoustic kit and ran across this Gretsch Catalina Birch kit at a local pawn shop. 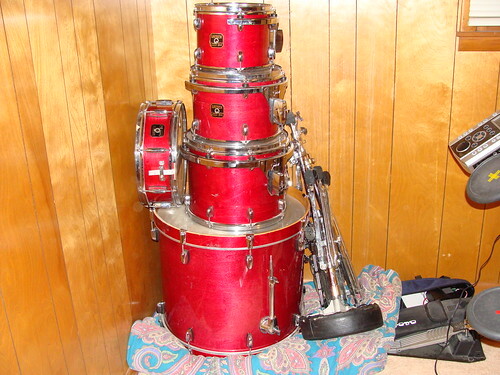 I got the whole thing, sans cymbals and some hardware, for about $225 plus tax. I think I got a deal, but the age of the kit eludes me. 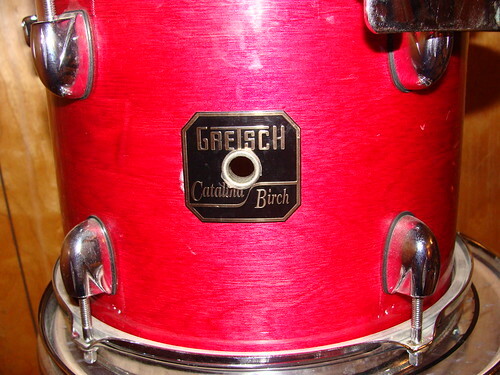 It appears Gretsch has sold and discontinued “Catalina Birch” kits at least a couple of times throughout its history, and I’m pretty sure this kit is not from the most recent go-round. I haven’t even played them yet, because I’m missing a hi-hat, ride and crash cymbals and one tom mounting arm. I hope to have all my hardware together by the weekend. Having “real” drums again is going to free me up to play with other people, something that’s been good for me so far. Hey, I gotta have SOMETHING to do to stay out of Nan’s hair. This entry was posted in Music on August 31, 2010 by Tracey. From Scott Aukerman’s Comedy Death Ray Radio podcast, April 30, 2010. This entry was posted in Miscellaneous on August 24, 2010 by Tracey. Starting on Jan. 29, 2010, we got about 4 or 5 inches of snow in Nashville, which is a much bigger deal for us than it might be for you who see this every year. 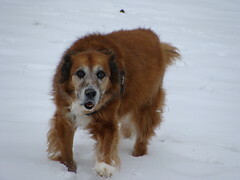 Rainy, our 14-year-old red mutt, likes the snow for a few minutes until it starts forming little icy balls in the hair of her feet. You can see more pictures, if you’re so inclined, here. This entry was posted in Uncategorized on January 30, 2010 by Tracey. I’ve all but abandoned PC gaming, preferring to avoid the upgrade arms race and stick with my (not too trusty) Xbox 360 and my seldom-used Wii. However, I’d had a Flash-based game called Machinarium on my radar for several weeks based just on some screenshots. So when the demo became available, I grabbed it. And a half-hour later, when I was done with the demo, I shelled out 20 bucks and bought the game. What a thing of beauty this game is. Someone has described it as a steampunk Wall-E, and that’s not a bad start. You control a cute anthropomorphic robot (probably built in Japan) through a decaying world. It’s not clear at first what your ultimate goal is; the first several levels involve just getting to the next one. But through flashbacks, you learn that things are not good. You manipulate the world solely via your robot by maneuvering him near objects and having him interact with them. Some solutions are reasonably clear, but some are a little more confounding. As with Myst, I felt pretty dumb throughout and did a fair bit of cheating (there are video and graphical walkthroughs out there, naturally) to finish. Oh, and the $20 download has NO DRM and includes versions for the Mac, PC and Linux, plus the beautiful soundtrack. This entry was posted in Uncategorized on October 24, 2009 by Tracey. I recently bought a used T-Mobile G1 phone on Ebay and have been spending the last couple of days getting to know it. The more time I spend with it the more I like it, and I’m sure that will continue as I understand it better. But it’s forcing me to abandon some of the tried-and-true applications I’ve depended on when I was using my T-Mobile Dash, which runs Windows Mobile. Because SplashID (a password safe) is poorly supported on Android, I have decided to just use a portable version of Keepass Password Safe on a flash drive and copy the database over to the G1 occasionally. I will no longer have a car maintenance tracker, or at least I can’t find one in the Android Market. And I still can’t get used to syncing over the air, something that’s kind of difficult if your wireless router doesn’t much like your phone. Still, I’m getting there. And my partner, who has adopted my Dash, is finding new a better ways to use it than I ever had. I hope they’ll be very happy together. If she gets it working TOO well, I’m stealing it back. This entry was posted in Miscellaneous on September 7, 2009 by Tracey. Porcupine Tree’s new release, The Incident, is scheduled to come out on Sept. 21. But if you’re looking for a sample before then, you can hear a radio(!) edit of “Time Flies” here. This entry was posted in Music on August 4, 2009 by Tracey. Since they hadn’t looked at my trade-in, he wanted me to come in OMG RIGHT NOW TODAY so they could look at it and see what they would offer. I live all the way the hell on the other side of Nashville – a 30-minute drive at least, and I would be passing by the dealership the next morning on a work trip. But no, the used car manager is going to be gone to auction then, according to the salesman. So I asked him to talk to his manager to see if it would even be worth my driving down there immediately, as he wanted me to. I gave him all the relevant details I can about my trade-in, even the VIN. He called back 10 minutes later and said, “I think we can make this work out. The used car manager needs to look at your trade-in to see if everything checks out, but I think we can do this.” So of course I headed on down. I wait in the salesman’s office for close to an hour while they drive my trade-in, chill me out, whatever they do for an hour. He came back in with a proposal that was WAY off what I told him my bottom line was. The kickers: 1) They didn’t come down AT ALL from the previous offer they’d made, and 2) they low-balled my trade-in. I shook his hand and left. I know that’s what car dealers do, but the salesman KNEW when he had me on the phone that they weren’t coming down off their offer, yet he told me “I think we can make this work out” in order to get me down there. The salesman has only been on the job about four months, so I have a feeling this wasn’t his idea. His manager probably told him to just get me down there and that I’d eventually cave. I didn’t. And when I got home, having lost 2 hours I’ll never get back, I found a newer truck online at a different dealership, with fewer miles and with a color I preferred. I’m working on getting an appointment to see it. So I guess I’m lucky Crown Ford jerked me around. Let me be clear: I’m not angry that they didn’t give me the price I wanted. Things happen – my numbers didn’t work for them, and their numbers didn’t work for me. That’s business, and I’m a big girl. No, I’m angry that the salesman lied to me to get me to come back in there. I don’t like games, and I don’t like having my time wasted. I will never darken Crown Ford’s doors again unless they somehow become the only place in town that will change the oil in an F-150. This entry was posted in Miscellaneous on July 31, 2009 by Tracey. I’ve been a little bit addicted to Red Faction: Guerrilla for the past few weeks. I finished the campaign about a week and a half ago, but I still haven’t run out of things to do. It’s an open-world, everything-is-destructible shooter that asks where the line is between “freedom fighter” and “terrorist.” I’m pretty sure I crossed the line when I was asked to – and did – snipe those civilian businessmen attending a meeting. But that’s not why I’m posting this. I’m posting this to add to collective Google-able knowledge about this game, and my contribution is walker spawn locations. 2) Eos, near the Eastern safe house, next to those two tall buildings under construction (light walker). Look for that blue covered building, and the walker will usually be there out in the open. 3) Eos, in a parking lot due north of EDF Central Command (heavy combat walker). Not in a garage. This entry was posted in Gaming and tagged Gaming, Red Faction:Guerrilla on July 6, 2009 by Tracey. Technically this is a blog. However, having tried and failed several times to maintain a blog, I know better than to claim I’ll be updating this one with any regularity or to think anyone would read it anyway. Rather, this is just a place for me to drop my random stuff and provide links to other places where I have a presence.